Héva Coomans (1860-1939), Offerings (c 1900), further details not known. Wikimedia Commons. Like the Alma-Tademas, the Coomans family was Belgian. Father Pierre Olivier Joseph Coomans (1816–1889) initially studied in Ghent, then at the Academy of Fine Arts in Antwerp under Nicaise de Keyser and Gustave Wappers. In 1857, he visited the remains of Pompeii, which was to be a lasting inspiration to his work, and that of his children. Commercially he was very successful, and his paintings sold particularly well to American collectors. 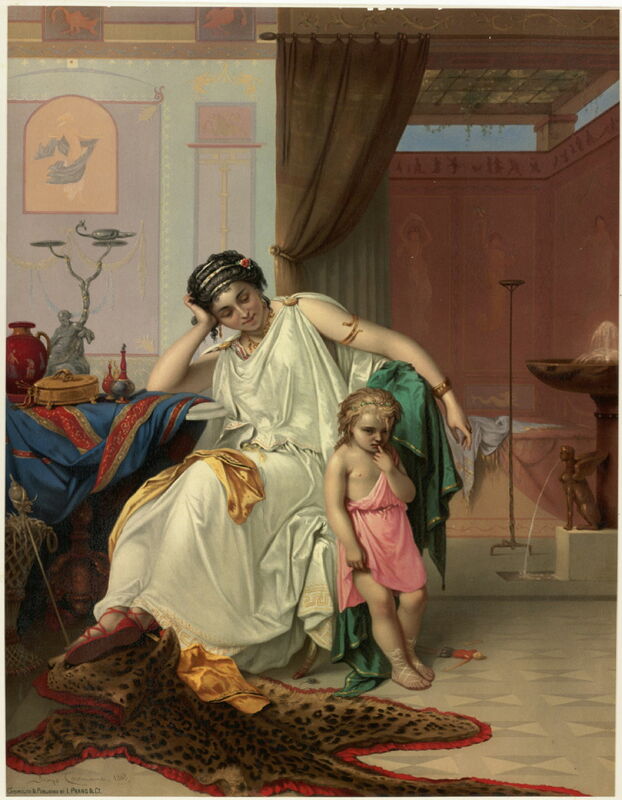 Pierre Olivier Joseph Coomans (1816–1889), A Family Scene in Pompeii (1858), chromolithograph of original painting, further details not known, Boston Public Library, Boston, MA. A Family Scene in Pompeii (1858) is one of his first paintings inspired by his visit to the ruins of Pompeii the previous year. It appears to be based on proposed reconstructions of everyday objects and interior decor, and is painted in highly-finished Salon style. Pierre Olivier Joseph Coomans (1816–1889), The Last Hour of Pompeii – The House of the Poet (1869), oil on canvas, 101 × 158.1 cm, location not known. Wikimedia Commons. Joseph and his children became most enthused about trying to depict Pompeii in the fateful hour or so before disaster struck. 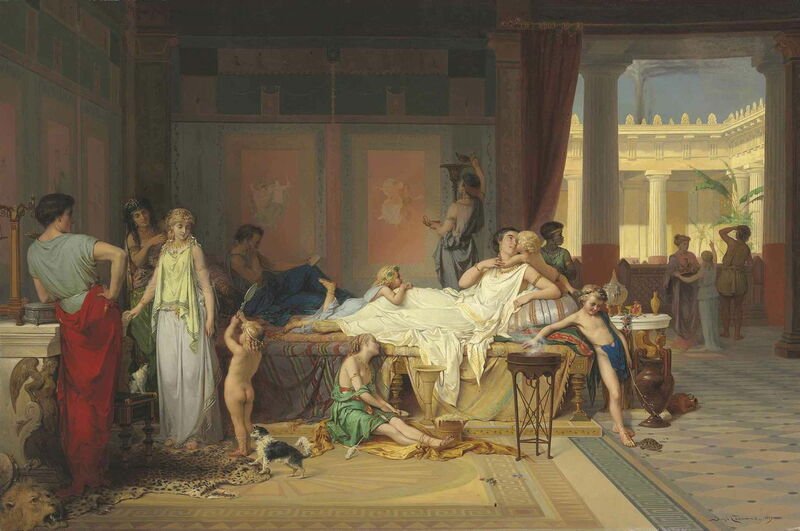 The Last Hour of Pompeii – The House of the Poet (1869) is a very detailed reconstruction showing a crowded interior of a spacious villa. Coomans clearly had a great eye for detail, showing family pets such as a couple of cats and a tortoise. In the distance, plumes of black smoke rise from the growing eruptions of Vesuvius, which was shortly to engulf and kill everyone present. Pierre Olivier Joseph Coomans (1816–1889), The Farewell (c 1873), chromolithograph of original painting, further details not known, Boston Public Library, Boston, MA. 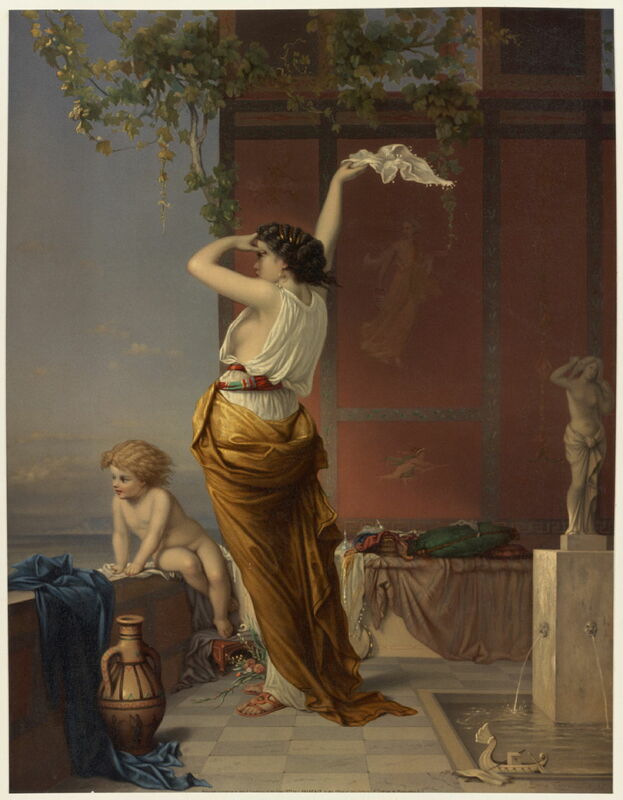 The Farewell (c 1873) shows a wife waving to her husband as he departs by sea from her and their child, in their classical Roman setting. Floating on the water of their fountain at the bottom right is a child’s model of the ship in which father/husband has gone to sea. Behind the woman are the fibrecraft activities with which she will now occupy her time, perhaps drawing parallels with Penelope during the absence of Odysseus. 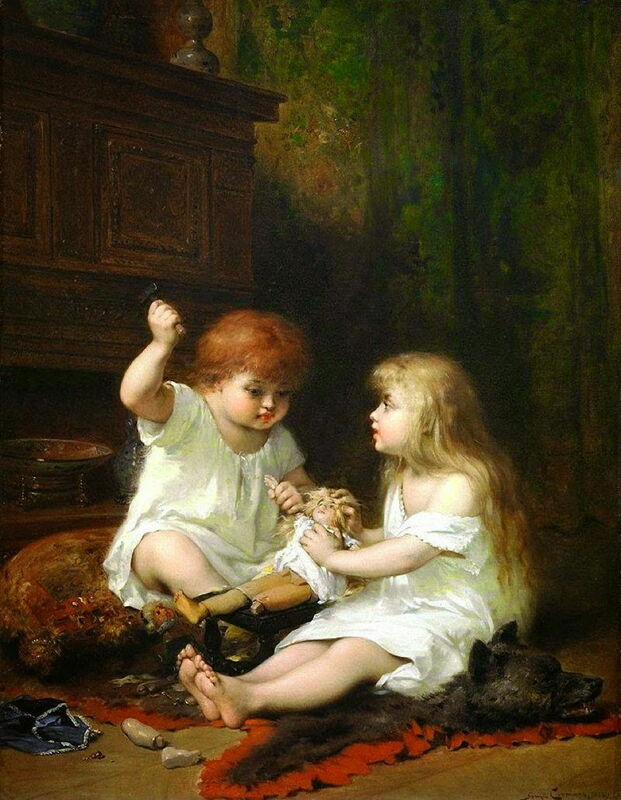 Pierre Olivier Joseph Coomans (1816–1889), Children (date not known), further details not known. Wikimedia Commons. Children (date not known) looks more contemporary, and could date from the late 1860s and show his own two daughters, perhaps. One is taking a swing at her sister’s articulated wooden doll, in an apparent bid to continue dismembering it. Joseph Coomans had two daughters and a son who became successful painters. 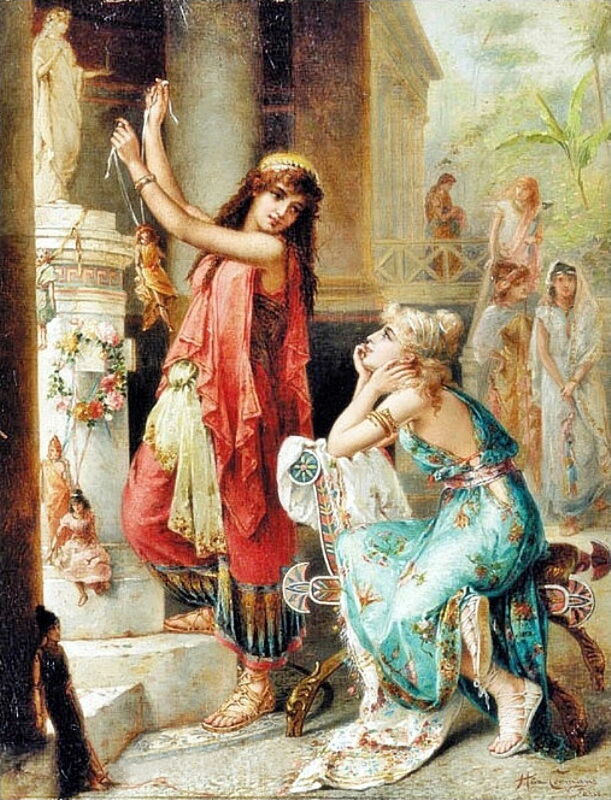 Oscar-Jean Coomans‘ (1848–1884) work seems to have vanished without trace, and Diana Coomans‘ (1861-1952) work is still in copyright, so I will show here the few paintings by Héva Coomans (1860-1939) for which I have been able to discover reasonable images. Little is now known about the Coomans sisters: they trained in Europe, probably in Paris, and in 1910 emigrated to live in New York, where they died in 1939 (Héva) and 1952 (Diana). Héva Coomans (1860-1939), Two Young Italian Women Meeting at a Window (1887), oil on canvas, 71.1 x 50.8 cm, location not known. Wikimedia Commons. 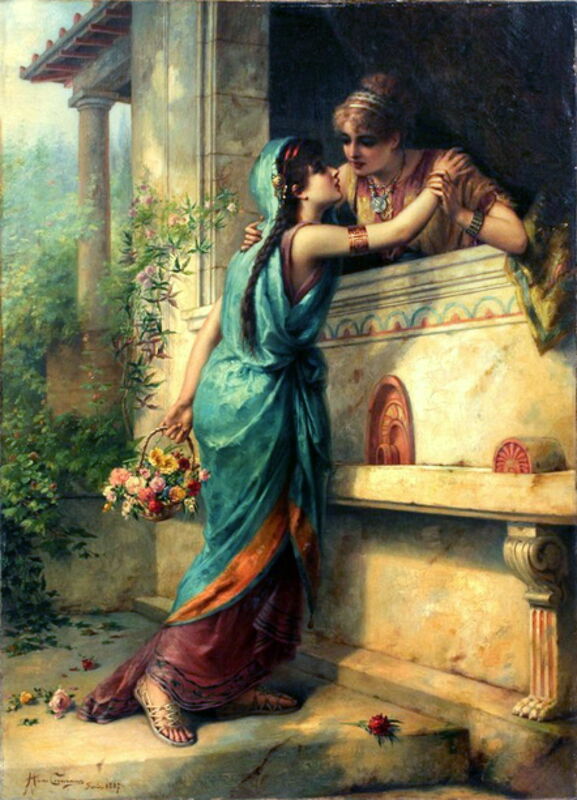 Two Young Italian Women Meeting at a Window (1887) appears to show these two close friends in classical Roman times, with the ornate painted marble of an opulent villa. 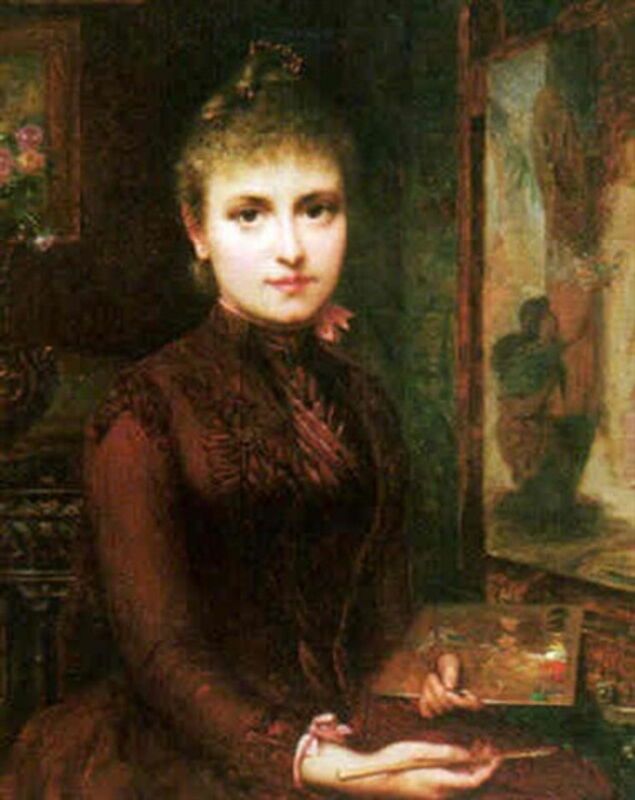 Héva Coomans (1860–1939), Self-portrait (1888), oil on canvas, 43 x 33 cm, Private collection. Wikimedia Commons. 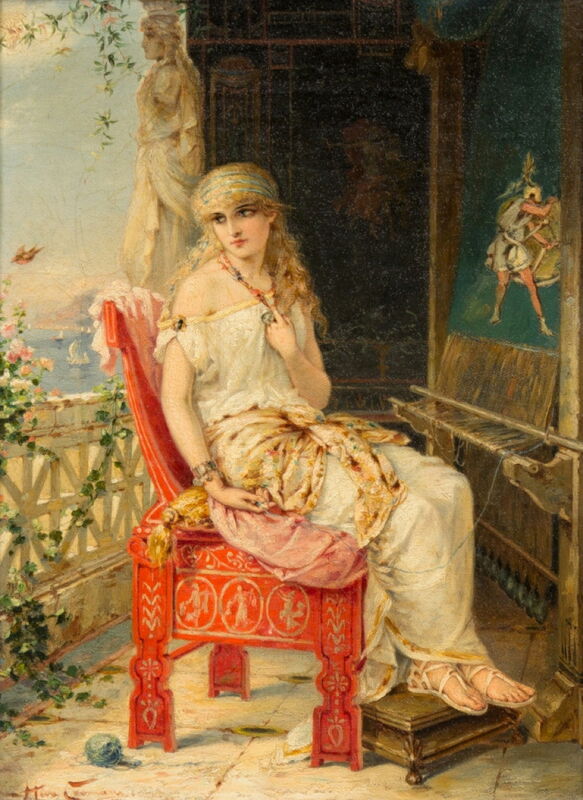 Héva’s Self-portrait from 1888 shows her working at the easel on one of her paintings of classical Roman times. The decor here is similar to that of her father’s Children. All the remaining works that I have by her have been dated to about 1900, which I would suggest is little more than a guess. 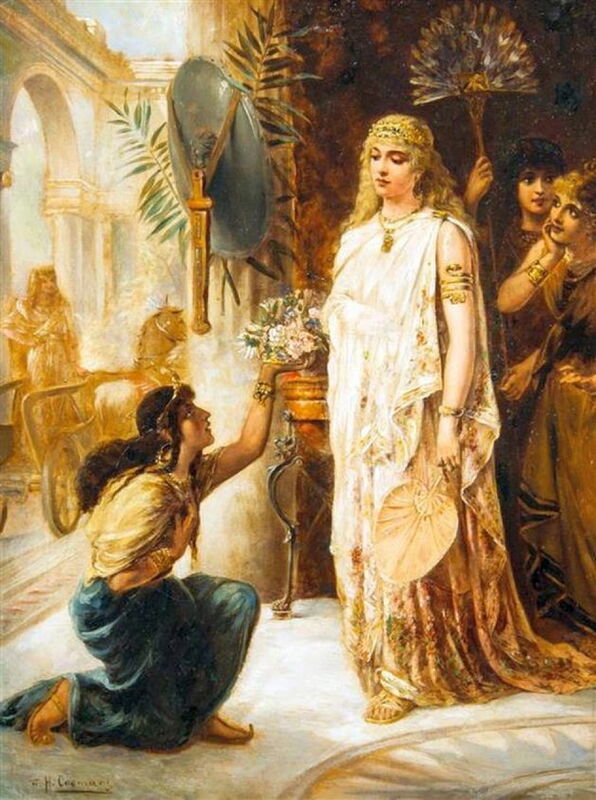 Héva Coomans (1860-1939), Penelope Awaiting Odysseus (c 1900), further details not known. Wikimedia Commons. In Penelope Awaiting Odysseus (c 1900), the wife of Odysseus is weaving an image of her husband as warrior, celebrating the victory at Troy. She pauses to look over her shoulder in the hope that the sails of his ships might appear any minute now, although he was making only slow progress during the ten years which elapsed of his Odyssey. 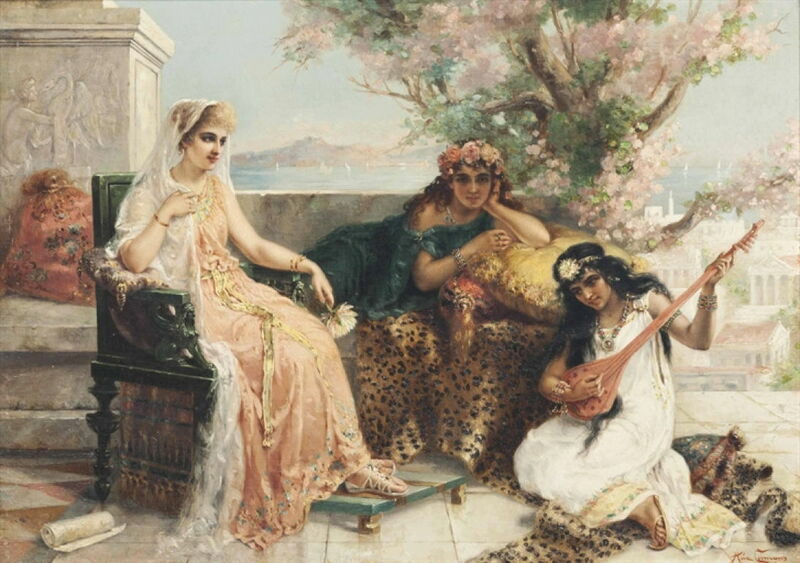 Héva Coomans (1860-1939), A Melody for a Roman Beauty (c 1900), oil on canvas, 50.9 x 71.2 cm, location not known. Wikimedia Commons. 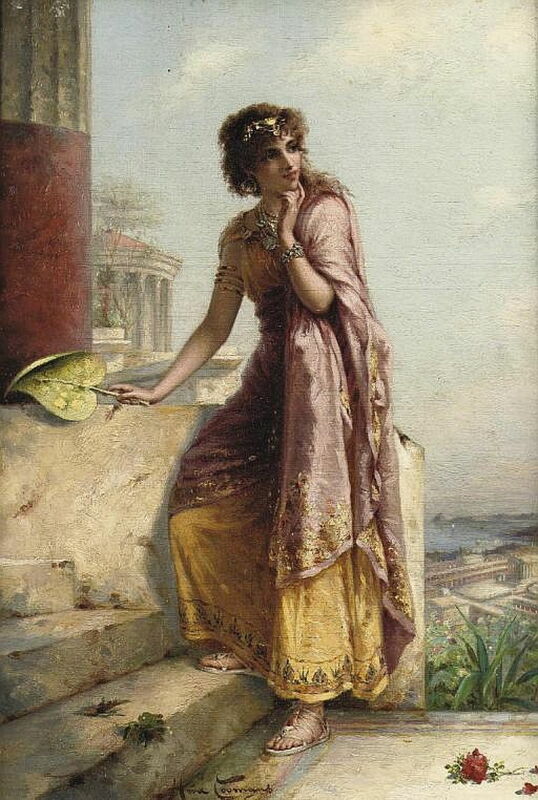 A Melody for a Roman Beauty (c 1900) is set in a Mediterranean location in classical Roman times, judging by the landscape and the city below. The musical instrument being used would have been unusual, as it appears to be a pandura or lute, which was played rarely in comparison with the lyre and cithara (a type of large lyre), which were more characteristic of the period. None of the women appears to be singing, either. Héva Coomans (1860-1939), A Young Woman by a Temple (c 1900), oil on canvas laid on board, 31 x 22 cm, location not known. Wikimedia Commons. A Young Woman by a Temple (c 1900) appears more painterly in style, and may have been painted rather later. The full-length figure is seen against another backdrop of a classical Roman town or city, on a Mediterranean coast. Héva Coomans (1860-1939), Woman in Supplication (c 1900), further details not known. Wikimedia Commons. Woman in Supplication (c 1900) is a more complex subject. A plainly-dressed woman with long dark hair kneels in supplication as she offers a woman (‘B’) of overtly higher caste a small floral gift. Behind B is another woman of similar standing, looking intently at B’s head, as if gauging her reaction. Deeper still into the painting is a servant, who is fanning B. At the left, a driver stands in a one-horse chariot, as if waiting for B to conclude her business before taking her away at the rush. Offerings (c 1900) contains some rich details which resemble those in her father’s paintings. Two women are at a shrine devoted to a Roman goddess. One is about to tie a small articulated doll to the shrine, while the other sits and watches. This may be a depiction of the rite in which a bride surrendered her childhood doll to her family Lares on the night prior to her wedding, as a sign that she had come of age. However, that more typically took place at a family shrine of the Lares, not a public one. If you know any more, particularly about Héva or Diana Coomans, I would love to hear about it. Posted in General, Painting and tagged Alma-Tadema, Coomans, painting, Pompeii, women in art. Bookmark the permalink.